MEXICO CITY, Apr 3 2014 (IPS) - Scientists warn that large-scale fracking for shale gas planned by Mexico’s oil company Pemex will cause a surge in seismic activity in northern Mexico, an area already prone to quakes. Experts link a 2013 swarm of earthquakes in the northern states of Tamaulipas and Nuevo León to hydraulic fracturing or fracking in the Burgos and Eagle Ford shale deposits – the latter of which is shared with the U.S. state of Texas. Researcher Ruperto de la Garza found a link between seismic activity and fracking, a technique that involves pumping water, chemicals and sand at high pressure into the well, opening and extending fractures in the shale rock to release the natural gas. “The final result is the dislocation of the geological structure which, when it is pulverised, allows the trapped gas to escape,” the expert with the environmental and risk consultancy Gestoría Ambiental y de Riesgos told IPS from Saltillo, the capital of the northern state of Coahuila. De la Garza drew up an exhaustive map of the seismic movements in 2013 and the gas-producing areas. His findings, published on Mar. 22, indicated a correlation between the seismic activity and fracking. Statistics from Mexico’s National Seismological Service show an increase in intensity and frequency of seismic activity in Nuevo León, where at least 31 quakes between 3.1 and 4.3 on the Richter scale were registered. Most of the quakes occurred in 2013. Of the ones registered this year, the highest intensity took place on Mar. 2-3, according to official records. De la Garza said the number of quakes in that state increased in 2013 and the first few months of this year. The Burgos basin, which extends through the northern states of Nuevo León, Tamaulipas and Coahuila, holds huge reserves of conventional gas, which began to be tapped in the past decade. Since 2011, PEMEX has drilled at least six wells for shale gas in the states of Nuevo León and Coahuila. It is also preparing for further exploration in the southeastern state of Veracruz. The company has identified five regions with potential unconventional gas resources from the north of Veracruz to Chihuahua, on the U.S. border. The U.S. Energy Information Administration (EIA) ranks Mexico sixth in the world for technically recoverable gas, behind China, Argentina, Algeria, the United States and Canada, based on examination of 137 deposits in 42 countries. The recovery of shale gas requires enormous quantities of water and a broad range of chemicals. The process generates large amounts of waste fluids, which contain dissolved chemicals and other contaminants that require treatment before recycling or disposal, according to the environmental watchdog Greenpeace. 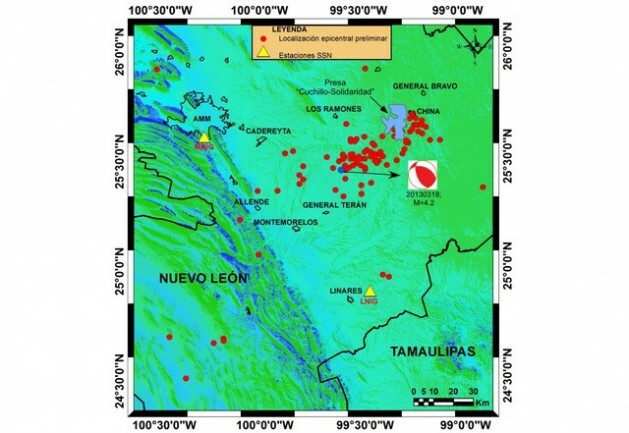 The study “Sismicidad en el estado de Nuevo León”, published in January on seismic activity in that state, concluded that the quakes in northeast Mexico are associated with both natural structures and human actions that modify the rock layer and the pressure in the fluids near the surface. The report, by academics at the Civil Engineering Faculty of the Autonomous University of Nuevo León, attributes several earthquakes that have occurred since 2004 to activities such as the extraction of unconventional natural gas in the Burgos basin. Other factors mentioned by the study are the overexploitation of aquifers by potato producers along the border between Coahuila and Nuevo León and barite mining in Nuevo León. The total number of water wells drilled in the basin has risen from just under 5,000 in 2004 to 7,000 today. A study on the environmental impact of the Poza Rica Altamira y Aceite Terciario del Golfo 2013-2035 regional oil project, which extends across the states of Veracruz, Hidalgo (in the centre) and Puebla (in the south), anticipates a rise in demand for water for fracking in the north of the country, where water is scarce. The 844-page document, to which IPS had access, was sent by Pemex to the environment ministry for approval on Mar. 10, and enumerates projected works like the construction of roads and installation of large steel water storage tanks. The study states that over 12,700 cubic metres of water are needed for every 10 multi-stage fracking jobs. It also estimates that Mexico’s natural gas production will reach 11.47 billion cubic feet a day by 2026, which would come from the higher levels of shale gas production at the Eagle Ford and La Casita deposits stretching across Chihuahua, Coahuila, Nuevo León and Tamaulipas. By 2026, non-associated natural gas will represent 55 percent of total gas production. The rest will come from unconventional deposits in the north of the country, whose production is projected to grow at a rate of 8.6 percent per year up to then. Production of unconventional gas is expected to be in the hands of private companies, since the energy reform approved in December opened up the oil and electric industry to foreign investment. U.S. Geological Survey scientists have found that in some areas, an increase in seismic activity has coincided with the injection of wastewater in deep disposal wells. “Earthquakes will increase as a result of the higher-scale shale gas production. The government is misguided. Fracking should be banned,” de la Garza argued. Our firm, Global Speak Network Translations, is ready and in position to support all the technical oil and gas translation needs as companies expand into Mexico. We have experience in the Pemex energy language and we are here to be your contracted and exclusive translation resource. We are ready to move forward to increase your global footprint. Just for the record… Oil & Gas Companies absolutely HATE earthquakes because they can cause huge amounts of damage to the entire hydrocarbon infrastructure (wells, pipelines, tanks, roads, etc.) of a production field in a matter of seconds. The key to understanding if fracking and/or deep inject wells are contributing to earthquakes can simply be determined by comparing the depths of the earthquakes verses the depths of the formation being drilled into. Fracking at 2 miles down will just NOT cause an earthquake in a fault zone anywhere much deeper than that. USGS calculates epicenter depths for most measurable earthquakes. They have maps on their websites.